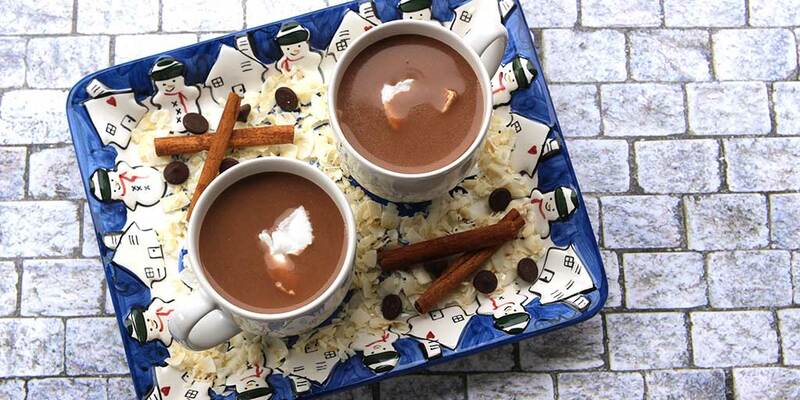 Do you miss hot chocolate? I do. Coconut hot chocolate seems to be all the rage right now, so I decided to give it a try. With dairy-free coconut milk, dark chocolate, and cinnamon, what’s not to like? I loved hot chocolate as a kid. Some of my friends made it by boiling water and then pouring it over chocolately powder that came in a packet. It was watery and downright gross. Definitely not hot chocolate in my book. 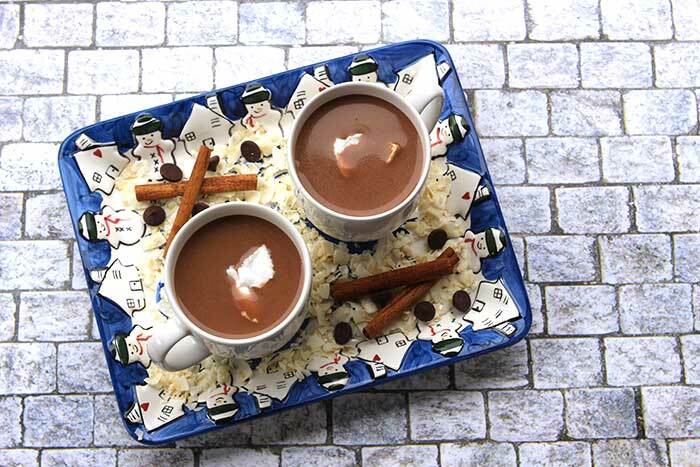 When Mom made hot chocolate, she’d simmer milk on the stove, then pour it on top of a magical sweet chocolate mixture. Sometimes we had marshmallows, but they weren’t a requirement. Milk was absolutely mandatory, however. Hot chocolate must be creamy. When I thought about how rich and creamy coconut milk is, I decided coconut hot chocolate would be right up my alley. I swapped dark chocolate for milk chocolate and sugar, then I added a dusting of cinnamon. This is grown-up cocoa. Enjoy this three-ingredient coconut hot chocolate on a cold, snowy night. You could also put some out for Santa; it’s pretty good cold too! You might look at the nutritional information for this coconut hot chocolate and think “Yikes! I can’t have that much fat.” I’m a firm believer that low-fat diets steered us in the wrong direction and fats like those in coconut milk and avocados are actually good for you. (Note I’m not a health professional and many dietitians disagree with me. Decide for yourself what’s best for you.) I will say my version of hot chocolate has 13g carb and Starbucks’ hot chocolate has 50g. That’s a win in my book. Also, dark chocolate and cinnamon are listed as some of the best superfoods for people with diabetes. Set aside two tablespoons of the coconut cream (thick part), then pour the rest of the coconut milk into a small saucepan. Add chocolate chips and place over medium heat. Stir frequently until mixture just begins to bubble. Reduce heat to low and simmer about 5 minutes, stirring occasionally. The mixture should thicken slightly and be very smooth. Pour into small cups, top with reserved coconut cream, and sprinkle with cinnamon. Tip: Before you open the can of coconut milk, turn it upside down. The thick cream accumulates at the top of the can, so when you flip it, the watery part is at the top and the thick stuff is at the bottom. This makes it easier to pour. Wow you have just used coconut milk in the best way! 😄 Thank you for this recipe! Is this really 4 servings? Only 3.5 ounces each? Kristy – Yes, it’s rich, so that’s more than enough for me. (Think espresso cup.) If you can afford the carbs and you’re okay with the amount of fat, feel free to double your serving size.